The institutional church has very little to offer people in the way of hope and assurance. Its orthodoxy takes away a believer’s means of showing love to God and others – obedience to the law. By making perfect law-keeping the standard for righteousness, its single perspective on law keeps believers “under law” and in a constant state of fear due to condemnation. But the Bible says that there is no fear in love because perfect (mature) love casts out fear. We have before us today yet one more example of the orthodoxy of authentic Protestantism to consider. This example happens to come from my former church, Calvary Bible Church in Columbus, OH. 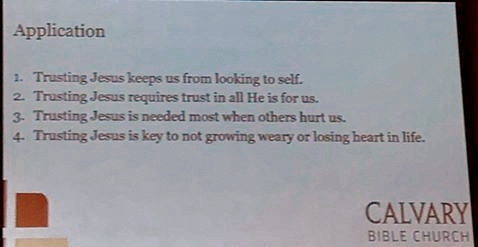 One of the current members snapped this image of a power point slide presented during this past Sunday’s sermon. This slide comes at the “application” part at the end of a sermon which used Hebrews 12:1-2 as a text. Before I even get into addressing the points of application, a brief exegesis and word study of the passage is required. It is important to understand that the chapter divisions in our Bibles are not there in the original texts. They were added much later as a means to aid in finding certain passages. The unfortunate result is that sometimes the chapter divisions have a tendency to break up the context. Chapter 12 of Hebrews is the concluding application of chapter 11, sometimes known as the “Hall of Faith”. The “cloud of witnesses” mentioned in verse 1 is a reference to all the saints mentioned in chapter 11, some by name, some collectively. I want to quickly call your attention to the verbs in verse 1. I have marked them in bold. This is a very poorly translated verse in both the King James and all modern English translations. While there are five verb forms in this verse, only one verb is part of the main clause and shows the action. It is the word “run”. In the Greek the word is τρεχω (trek-oh). We get our English word “trek” from this, referring to a course or trip or voyage in which we may engage. This is the reasonable conclusion the writer of Hebrews draws from the testimony of all the saints mentioned in chapter 11. The other four verb forms are actually used as participles. A participle is a verb that is used as an adjective or adverb. In English, participles most often end in “ing”. A participle can either describe how an action is performed or it further describes the state of a noun or subject. Knowing then that the other verbs in verse 1 are participles, the verse would better read this way (notice the participles are emphasized in bold). We have a group of spectators “watching” us. These are the faithful saints who have gone on before us who have given us an example of how WE are then expected to conduct our lives. We have the ABILITY to run this race of life with certainty because we have already laid off everything that would hinder us. It is not something we need to do continuously. The aorist (past) tense of the verb indicates it is something that we have already done. Because of our new birth the law is ended, the old man is dead, and sin no longer has any power over us. Sin can no longer restrict us from running as fast as we want to. Verse 2 gives us further instruction as to “how” or “what” we should do as we run our life race. It begins with the phrase “looking unto Jesus”, but that does not indicate that we “trust Jesus” to run the race for us or even to help us run. The word in the Greek is αφοραω (ah-for-AH-oh). It literally means to perceive from a distance, but the implication means to consider attentively. Another expression that needs to be examined is “the author and finisher of our faith”. First off, the word “our” is not found in the Greek text, neither is it implied. “Author” is the Greek word αρχηγον (arch-AY-gon), and it means “chief leader”. Jesus is not the “author” of faith as if He was the originator of it. Consider the context of the passage. In the great cloud of witnesses just mentioned in chapter 11, among all of those in that great “hall of faith”, Jesus is the Chief Leader of faith. This means that Jesus is included among all of the saints listed in chapter 11. The author of Hebrews is exhorting us to consider Jesus’ own example of faith. Furthermore, a close look at the grammar of verse 2 reveals that the verse is not saying that our faith originates and ends with Jesus. Instead, these are two separate aspects of who Jesus is with regard to faith itself. The word translated “finisher” is the word τελειωτης (tel-ee-oh-TACE). It comes from the word “teleos” which means “maturity” or “completeness”. Jesus is the one who made “faith” complete. If you consider that the audience of Hebrews is Jews, this aspect of Jesus completing faith takes on considerable significance. Remember that God made the promise of a “seed” to Abraham. The apostle Paul also wrote in Galatians about the law being a guardian until “faith” came. With this in mind it is fairly easy to see that Jesus was the promised “seed” and the “faith” that came to end the law. I believe this is the reference the writer of Hebrews is making when he says that Jesus is the “completer” of faith, because Jesus was the promised seed of Abraham, the “faith” that came to end the law and make the new birth possible. So in verse two, as we run our life race, we are to give attentive consideration to the Chief Faith Leader; the Faith Completer; Jesus! Not only is “faith” completed because Jesus is that promised seed, but we are to consider His example of faith. The rest of the verse cites Jesus’ own example of faith. So now that we understand the correct grammatical-historical context of the passage, let us once again consider the points of application suggested to us by the pastor of Calvary Bible Church. Please notice that the passage in Hebrews has nothing to do whatsoever about trust or trusting Jesus. This should be blatantly obvious. How does one make the leap from a context having to do with great examples of faith for us to emulate to one of “trusting Jesus”? If one uses a redemptive-historical hermeneutic, it’s fairly easy. Every verse has to be taken in its proper “gospel context”. A believer then must continually “trust Jesus” for daily salvation instead of looking to himself. A believer must “trust Jesus” to do good works through him rather than trying to do any good works himself. A believer must “trust Jesus” to be his righteousness for him since the believer is only declared righteous. A believer must “trust Jesus” by recognizing his own sinfulness, depravity, and need for constant forgiveness rather than dwell on how other people have wronged him. A believer must “trust Jesus” by continuing to live by “faith alone” and persevering in the off chance that maybe he is one of the elect who endures to final justification. Of course, if at any time you fail to somehow keep “trusting Jesus,” your very salvation may be at stake. Sure sounds like an encouraging New Year’s message to me. Good luck with that. Truman himself was a willing participant in this ruse. One could argue that he was simply an innocent victim in the whole matter, but consider how much he was willing to overlook in his life for such a long time just so that he could go on living the only life he ever knew. That fact was a major point in the film, when a disgruntled viewer called the show and told the show’s creator just how wrong she thought it was the way they were using Truman for their own ends. The creator’s response was profound and powerful. 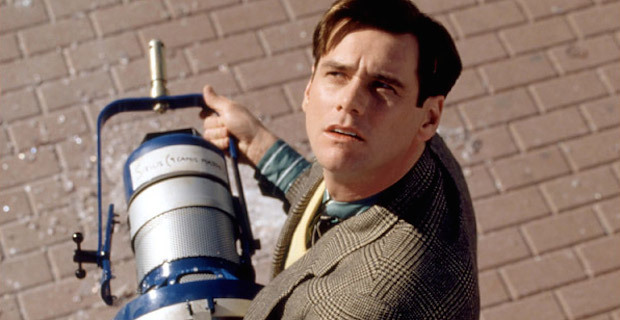 He said that if Truman REALLY wanted to discover the truth, he would find a way, and that when that happens, there would be nothing they could do to stop him. The point being of course was that the mere fact that Truman lived this life for so long was a statement to the reality that he really didn’t want to know the truth.